For over 34 years IMEX has consistently provided the highest quality bags at the most competitive price. We only use IMEX's Eco-Lite Vinyl on all bags. IMEX supplies vinyl, PEVA, nylon, canvas, hemp, PPNW (polypropylene-non woven) mesh and combination bags in all shapes and sizes. 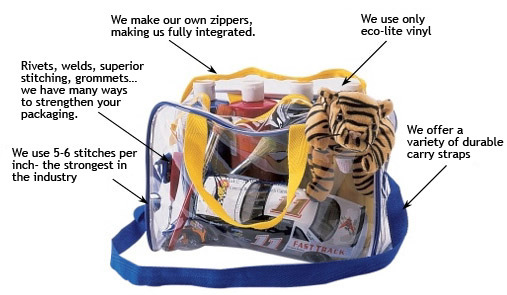 IMEX bags can be made with durable straps, rope handles, draw strings, hangers, or Velcro snaps. IMEX also makes safety vests, insulated cooler bags, knapsacks, bags with multi-colored silk-screen designs, and much more. When we help you design a bag we will keep green & sustainability concerns on the forefront. All custom bag orders are preceded by us making your approved sample before production begins.